This month I thought we would stick with the new Illuminati deck. This month’s card is 6 wands. 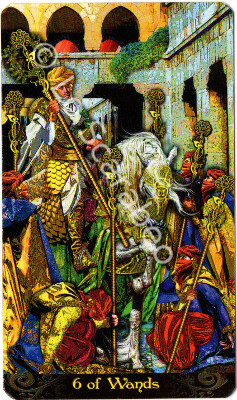 The image is very busy as most of this deck’s cards are, however it means all the image is in focus, rather than just the foreground, this enables us to consider meaning in many places of the image as equally important. So what do we have for December? We see a warrior returning from battle victorious, and being acknowledged for all he has overcome. He has returned victorious. You can see the gold of his costume representing self-esteem and confidence that comes from being honed through challenges. The people greeting him adorned in bright colours, their own self esteem high, rich and lush, they are able to see and truly understand what this warrior has gone through to achieve his current position. With this knowledge they look up to him and honour him for his strength courage and bravery. So in December we find ourselves reaping our harvest, we have survived the challenges of the year behind us and come out on top. not only are we feeling more confident and proud of ourselves but others can recognise what we have done too – we are seen for our efforts. We have also come home – back in the safety of the castle we can rest rejuvenate and restore ourselves amongst friends and family are an arduous set of challenges. So enjoy this month in celebration of what you have achieved. Earlier in the year you may have dismissed the efforts you were making as not being enough – or finding things difficult where you felt they should have been easy. You may have found others wondering what the issue was. This month however things are very different, as you look back you see the hard work and effort was worth it and you are able to appreciate yourself fully – without shame. Others reflect this back to you as you hear peoples thoughts and comments on what you have done and realise others do see your value and appreciate you for the risks you have taken, your bravery and your courage. The challenges may have been on an inner level – you may have been fighting old patterns of thought and behaviour, perhaps battling with depression or some form of psychological demon. Often unseen these battles we do alone, or with just a few to support us, this month though you find acknowledgement and support everywhere. Focus on acknowledging yourself, giving to yourself credit for the things you have had to face. Dealing with painful events requires a great deal of courage and the determination of the inner warrior, as you recognise yourself so your external world will understand you also and you will feel welcomed. The challenges may have been on a physical level, an illness, difficult living conditions, work or money, these too you have addressed head-on or with conscious strategy, as you have taken on the fight so you have used your courage and resilience to keep battling on – this month sees solutions, victory over difficulties and the chance to rest, celebrate and enjoy comfort with others in a place of safety and support. Whatever the challenges have been you have used them to further your spiritual growth, consciously or as a by-product, and now life rewards you for your effort. Enjoy your days spent with people – honour the team’s contribution to your efforts and recognise each person who congratulates you has their own areas of victory and valour, their stories of bravery and challenge. As you realise each person has their own battle field and turns up to do battle each day, so you also share your honour with those around you. You inspire some as they inspired you previously, you become a beacon for what is possible if you set your mind to it. And you build support within yourself for battles that will challenge you in the future.